After a somewhat tepid experience the previous night at the brand spanking new Bar Masa, I was looking to Sage to kick things up a notch. Sage is the creation of a Shawn McClain, chef and owner of the Chicago eateries Spring, Green Zebra, and Custom House (he has however, relinquished his stake in Custom House--Aaron Deal is now Executive Chef there). The San Diego native started his culinary career after high school, taking a dishwasher position at a restaurant in order to meet a girl that he was interested in! In 1990, after transferring from Miami University, McClain graduated from Kendall College's School of Culinary Arts in Evanston, Illinois. 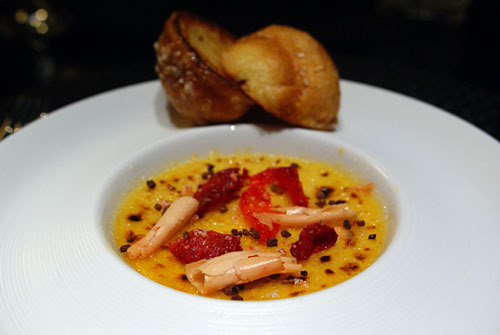 Following, he spent two years at The Boulevard at the InterContinental Chicago with Chef Stephen Junta. 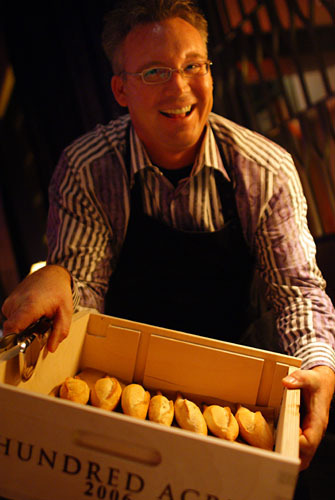 In 1992, McClain opened Bêtise in the city of Wilmette, but left after two years to serve on the opening team at Trio, under Rick Tramonto and Gale Gand. McClain was promoted to Sous Chef in January 1994, with the moniker of Chef de Cuisine coming the following year, and Executive Chef soon after that. In the span of seven years, McClain was able to establish a strong reputation for himself, both locally and at a nationwide level. However, in 2001, wanting to start his own place, McClain left Trio, and was subsequently replaced by none other than Grant Achatz. Taking a cue from Paul Kahan's Blackbird, he partnered with Sue Kim-Drohomyrecky and Peter Drohomyrecky to open Spring in Chicago, an Asian-tinged modern American seafooder. Spring was met with considerable success--it was nominated for James Beard's "Best New Restaurant" award, and McClain was deemed Esquire's "Chef of the Year"--which allowed McClain to start Green Zebra, a vegetarian restaurant, in 2004. The next year, McClain did a 180 and opened Custom House, a New American eatery with a focus on artisanal meat products. 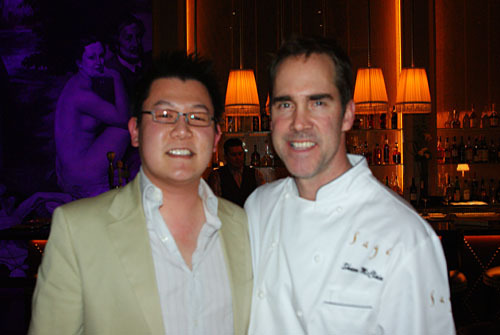 2006 saw McClain win the "Best Chef Midwest" title from the James Beard Foundation, and in late 2007, McClain began consulting on the menu for The Drawing Room at Le Passage (which is run by McClain's protégé Nick Lacasse). In 2008, McClain was able to begin work on Sage at Aria CityCenter, his globally-influenced contemporary American concept and the subject of this post. Aria's top three restaurants--Sage, Bar Masa/Shaboo, Julian Serrano (which we'd be visiting the next day)--are all clustered together near the hotel's registration desk. Inside, we get some reprieve from the hustle and bustle of the hotel lobby. Sage is divided into two sections, the bar/lounge space out front (where we were seated), and the main dining room in the back. Both areas are similarly-styled, sensuous and subtle, with shades of indigo abound. 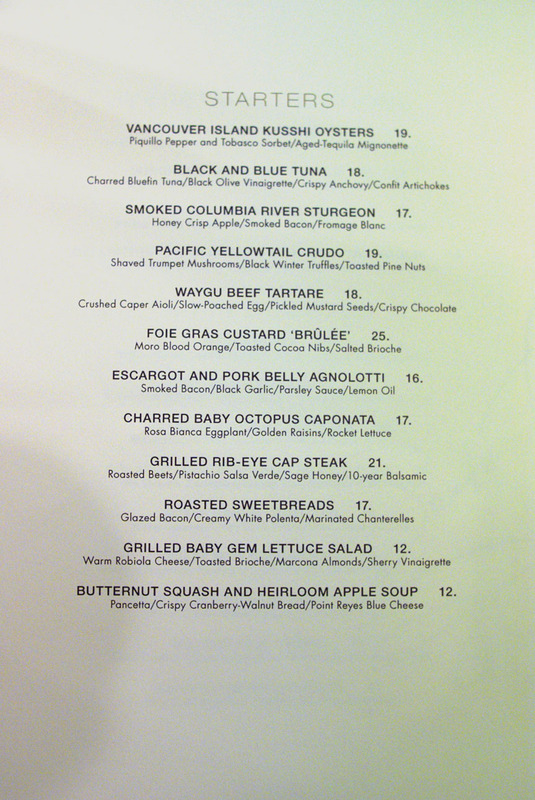 Above, we see Sage's straightforward carte, divided simply into starters and mains; click for larger versions. There is no degustation option, so we opted to build our own by sampling half the menu! Here we have Sage's selection of wines by the glass, cocktails, and beers; click for larger versions. To mix things up, we requested a beer pairing with the meal, and the sommelier Mike Shelter was more than happy to oblige. But before the brewskies, cocktails. 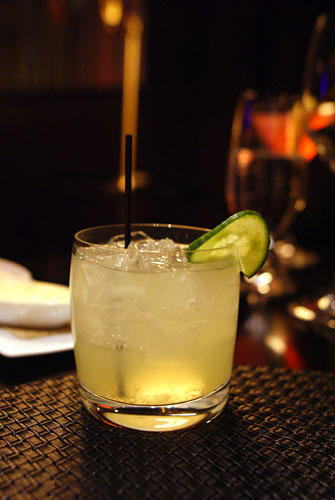 My dining companion wanted something with cucumber, so the bar came up with a refreshing Cucumber Collins. 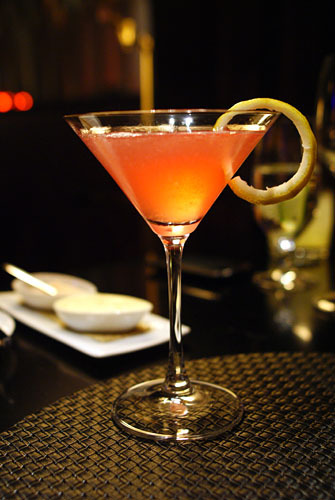 I, on the other hand, requested that the mixologist "surprise me;" a Ginger-Infused Cosmopolitan was the result. It was definitely one of the better Cosmos I've had, a light, subtly fruity libation with an intriguing hint of ginger--I likened it to ginger ale. 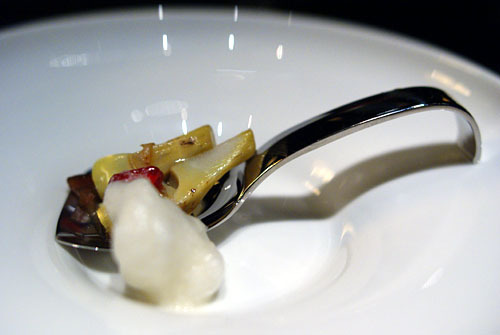 The amuse bouche consisted of a salad of artichoke, bacon, and date, garnished with a grape foam. The base of the amuse was definitely dominated by the vegetal tanginess of the artichoke, while the date added a touch of sweetness. The bacon, meanwhile, served as more of a crunchy textural element, as its saltiness was muted. The sole bread on offer was a delightfully delicate bacon baguette, served with puce-hued Murray River (Australia) sea salt and house-whipped butter. 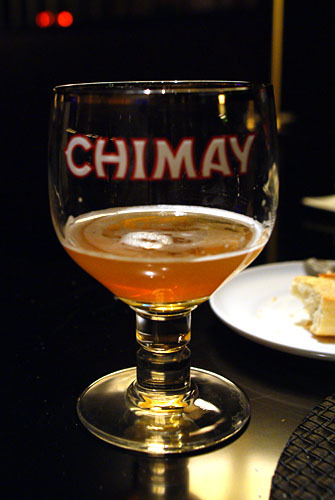 Our first beer of the night was the Chimay "Cinq Cents" Trappist Ale, Belgium [$12], which is served on draught. Also known as Chimay Blanche (White), it's done in the tripel style, and showed characteristic hoppy, sour, and spicy notes to match with the lighter seafood starters. 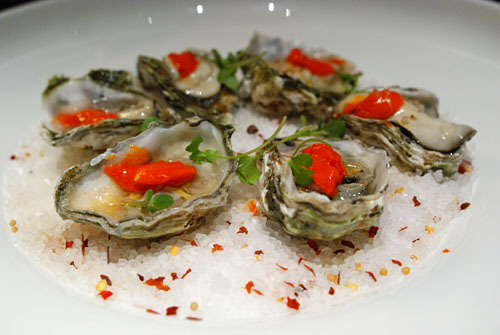 I love to begin with oysters, and just my luck, they happened to have Kumamotos, my favorite, in stock. The light brine of the oysters was apparent on the attack, while the Tabasco added a bit of heat in the middle, with the tequila providing an earthy weight. The best part, though, was the finish, imbued with the vegetal tang of pepper. Excellent. These reminded me of the "conchas" I had recently at Rivera in DTLA. 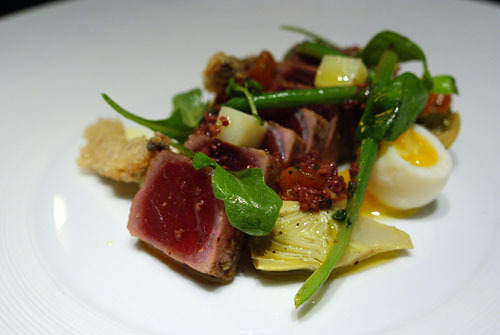 Taken alone, the black pepper- and fennel-crusted tuna was tasty, but unexciting. This was a case where the fish really served as a blank canvas for its accoutrements. First and more important was the quail egg, which contributed an overarching creaminess to the mildly-flavored fish. The olive vinaigrette, meanwhile, added heft, and the artichokes, a distinct tanginess. I really appreciated the anchovy, which accentuated the tuna's natural fishiness. 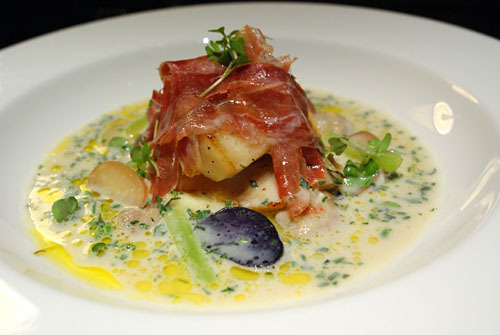 Here, the interaction between the sturgeon and fromage was instrumental, with the cheese providing a certain richness and weight to the fish that really allowed the other ingredients to sing. I liked the crunch, and more importantly, the salt imparted by the bacon, while the sweet crispness of apple was also very welcomed. Next, we have one of my favorites of the night. The yellowtail itself was expectedly clean and mild in savor--it'd make for a fine sashimi. 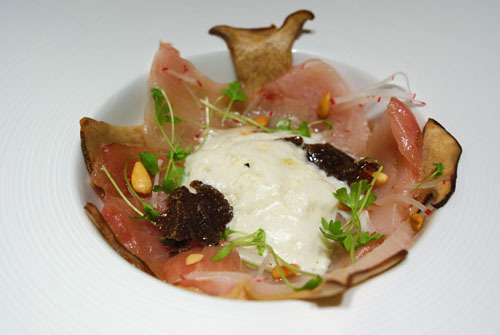 The truffle added a touch of earthiness into the fray, but the trumpet mushrooms were simply superb, adding a profound, and delicious, gravity to the hamachi. Rounding things out was the pine nut espuma, which contributed a lovely nuttiness to complete the dish. 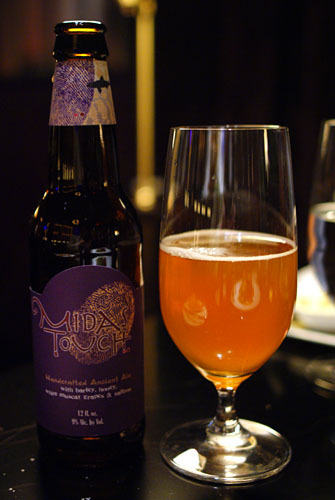 For the more substantial courses of beef and foie gras to follow, we were given the Dogfish Head Midas Touch, Delaware [$8]. Fascinatingly, the brew is based off of a chemical analysis of residues found in clay vessels buried in King Midas' tomb. Thus, it makes use of barley, Muscat grapes, honey, and saffron, resulting in a very "grape-y" aroma. The essence of Muscat continued onto the palate, where it was joined by spicy citrus flavors and honey, making for an overall heavy, heady concoction. 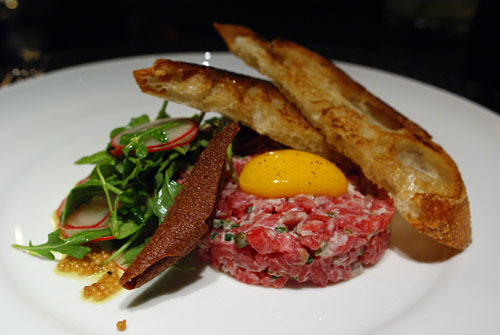 The tartare in and of itself was fairly traditional: tarted up by the capers, with the egg adding a permeating weightiness. Certainly, the arugula and radish salad tossed some levity into the mix, but the best part of this was the chocolate, which contributed a delightful bittersweet element that really did a great job offsetting the tartare. My dining companion, however, felt that the beef could've used more salt. As regular readers will know, I don't like my foie gras too sweet, so I was a bit wary of this dish. Fortunately, my fears turned out to be unfounded. Light and ethereal in body, the custard--with Grand Marnier, brandy, orange, and cocoa--was wonderfully imbued with the delicate quintessence of the liver, with only a touch of "eggy" sweetness. It was like eating a savory crème brûlée. Very good. Our next beer was the Dogfish Head Raison d'Etre, Delaware [$10], which, unfortunately, I forgot to photograph. Brewed with molasses and green raisins, it offered up delicious dark fruit notes that would pair well with the hefty dishes coming up. Set in a red wine sauce, the agnolotti were tasty enough, but I would've liked a bolder, more aggressive sapor--pork belly should've been more assertive. I felt that the pasta really took a back seat to the rest of the plate, the bacon in particular. At the same time, the snails were a nice touch, and the citrus did an admirable in counterbalancing all the heavy elements at play. The term caponata refers to a Sicilian eggplant salad dressed with a tangy sauce. Sage's version adds some superbly done octopus--beautifully charred, with a wondrous bitterness offsetting the cephalopod's natural sweetness. I really enjoyed eating the supple bits of octopus alone, though the smack of its sweet and sour accompaniments was enjoyable as well. Ironically, the eggplant was the least successful part of the dish for me. 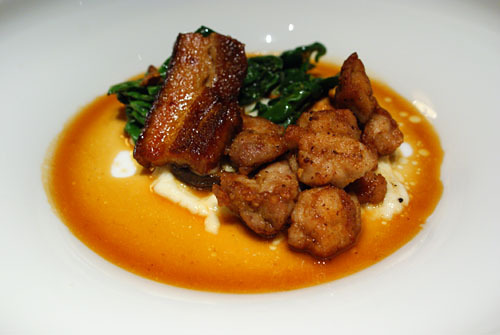 Sweetbreads can be hit or miss--this was definitely a hit. I loved how the chanterelles added a another level of earthy richness to the already saporous sweetbreads, while the greens (spinach?) provided a wonderful countervailing bitterness. My favorite part here, though, was the polenta; mild and creamy, it did a great job tempering the other elements at play. The bacon, however, was a bit superfluous. 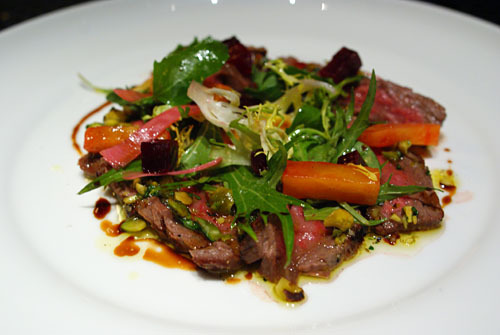 Our last item from the list of starters was this sort of "beef salad." Served cool, the ribeye itself was nicely done, not too heavy, deftly balanced by the tangy salsa and bitter greens. Though I'm not a huge fan of beets, they worked well enough here; I did feel, however, that the honey was a touch strong. 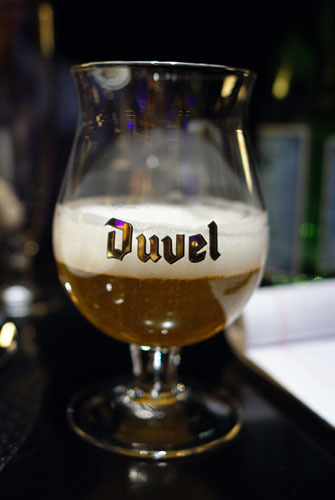 For our mains, we were given a goblet of Duvel, the definitive Belgian Strong Pale Ale, and one of my favorite beers overall. 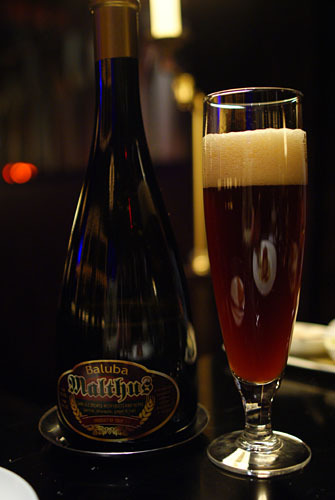 Far more interesting, though, was the second selection, Birrificio Di Como's Baluba Malthus from Italy. This is one that isn't on the menu, but instead came from the sommelier's private stash. 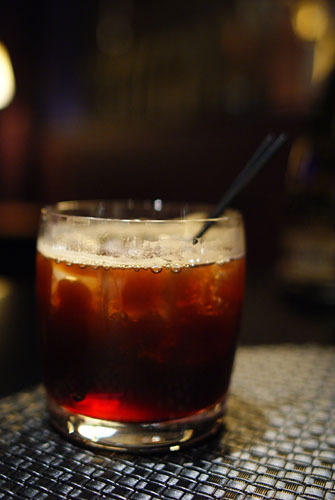 It was an absolutely fascinating brew, showing a tart yet sugary maltiness along with an almost Port-like character and flashes of balsamic vinegar--brilliant! Here was our sole selection from the "Vegetarian" section of the menu. Pairing egg and truffle isn't novel, but when it works, the results can be profound. Such was the case here. 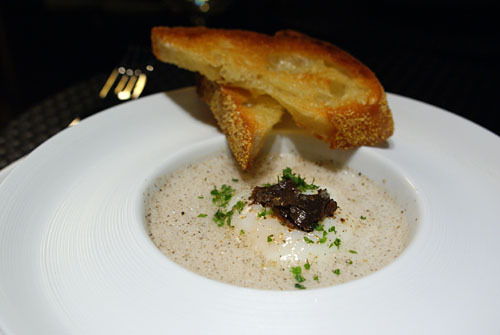 The heady, lingering perfume of the truffle was a flawless complement to the gently creamy egg. Meanwhile, the toast, with its you tiao-esque sweetness, provided a perfect moderating element. For our solitary main course, we chose the cobia, which is not often seen on menus. The fish demonstrated its characteristically firm, strongly savory flesh--it made me think of a more intense version of John Dory. The ham further accentuated the fish's saltiness, while the potatoes acted as a mitigating factor. My favorite accompaniment, though, was the clam chowder, which provided a lovely brininess to go along with the cobia, as well as a chewy textural contrast. And now, it was time for the sweet stuff. 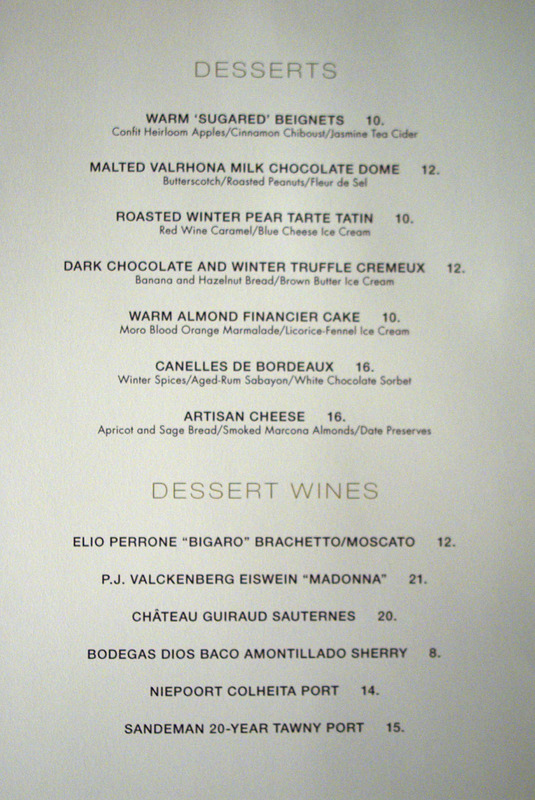 Sage's dessert menu (click for a larger version) is crafted by Pastry Chef Lura Poland. A New Hampshire native, Poland worked at numerous restaurants on the East Coast (including Italian Farmhouse in Plymouth, NH) before relocating to Las Vegas, where she was most recently the assistant pastry chef at Charlie Trotter's Restaurant Charlie. In fact, she may have even had a hand in the desserts that I enjoyed earlier this year at Bar Charlie! To go along with dessert, the sommelier paired one of Sage's specialty cocktails: the European Union [$14], made from Reserva Spanish Brandy, Young's Double Chocolate Stout, and Lindemans Framboise Lambic. The result was expectedly sweet, with the raspberry notes of the Lindemans taking center stage--think Raisinets. Our first dessert was like a deconstructed and reimagined iteration of LudoBites' Fourme d’Ambert Tourte! 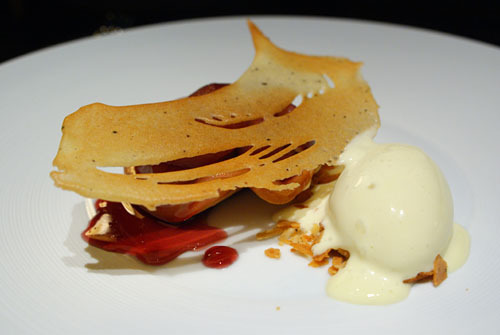 The sweetness of the pear was tempered by its pastry container, while the ice cream really captured the spirit of blue cheese, creating a sharp, countervailing component. Quite nice. A financier is a small, spongy cake, typically flavored with almond, originating in France. 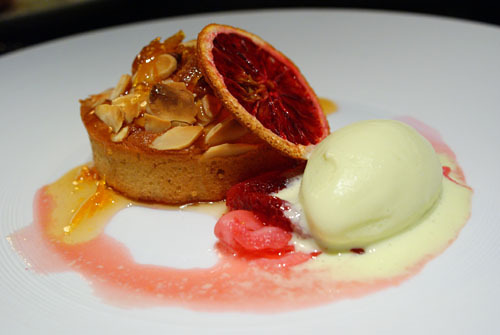 Here, the cake's light body and subtle sweetness were heightened by the blood orange (resulting in an almost fruitcake-esque flair), with the almond slivers contributing a marked nuttiness. The ice cream, meanwhile, served as a pungent, spicy contrast. Lastly, we have some canelés, small French pastries originating in Bordeaux. Traditionally flavored with rum and vanilla, they're known for their tough, caramelized crusts and soft, spongy, custard-like interiors. The canelés' heavy, eggy sweetness was further heightened by the sabayon, and went beautifully with the comparatively light sorbet. To close the meal, we were provided cups of citrus-infused chocolate syrup. 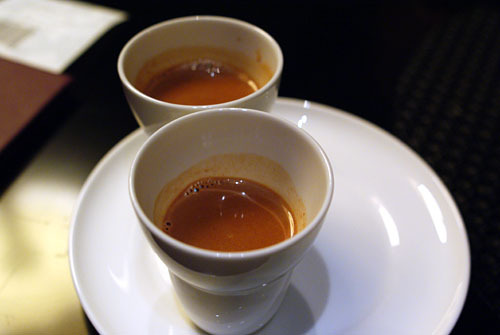 Drinking the syrup was just like sipping hot chocolate initially, with a light but lingering citrus flavor coming in only on the finish. Chef McClain came out to meet us at the end of meal, and we were able to chat with him for a few minutes regarding the food, plans for Sage, as well as the state of gastronomy in Chicago. Overall, I left Sage very satisfied. Service was pretty much spot-on, and though I could certainly identify nits with what I ate, the food was largely on point, and tasty--pretty impressive for only the second night of service. From what I gathered, McClain's cuisine at Sage effectively balances complexity with approachability and sensibility--my dining companion even made a comparison to Pierre Gagnaire--and I have high hopes for the restaurant in the future. Jealous of your recent Vegas gastronomic adventures, Kevin. Another great post and more beautiful photos. With City Center, it looks like I have a lot of Vegas dining to catch up on. Going to Vegas next month (one night only for niece's cheer competition). Must decide where to eat soon! Dying to try the Escargot and Pork Belly Agnolott here. This is one of the best looking reviews you've posted recently. 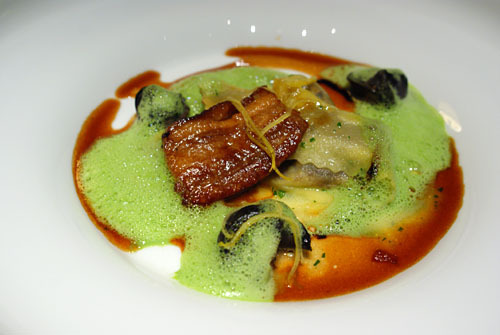 Another great post, I love to try the Escargot and Pork Belly Agnolotti. Thank for the post, I be lookinf firword to your "Julian Serrano" post soon. 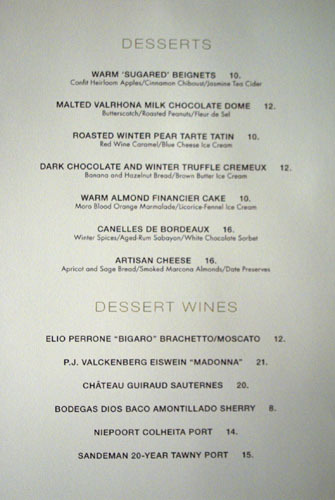 If you be in NYC area for the holiday, you should go for Le Bernardin's Truffle Tasting Menu is something to die for. Thanks for the tips, the pictures were really helpful for deciding what to choose. Of your recent Vegas experiences, Sage looks by far the most approachable. Good recap. I look forward to eating there on my next trip to Vegas. Linden: For sure. 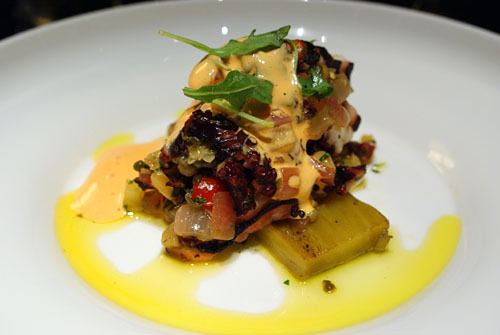 CityCenter definitely further cements Las Vegas as one of the premier dining cities in the US. What's on the top of your list? Jo: Why not stay for a few more nights? Where are you going to eat? sygyzy: By "best looking," do you mean that the photos look good, or that the food looks appealing? Dason: The Julian Serrano post is up! What do you like in Vegas? Vegas Girl: So how did you like Sage? Josh: For approachability, I'd also add Julian Serrano. With that said, I have feel more question about Sage. One of the most complained about "Vegetarian" dish is not execuation but more do do with the dish is nothing but a mixture of side dishes and it is not " filling". Does the "Vegetarian" dish you order give you that feeling at all? I might have misunderstood you. Do you have "Pacific yellowtail(yellowtail from North Pacific)" or "Pacific yellowtail(as in Pacific yellowtail emperor)"
The reason being is Yellowtail are under "Carangidae Family" better known as Amberjack, the most commond one find in restaurant are Japanese Amberjack (Hamachi) and Yellowtail Amberjack (call as Pacific yellowtail in some restaurant). But the "real" Pacific Yellowtail are under "Lethrinidae Family" better known as Emperor Breams, it is a completly different kind of fish. What is the story behind the woodern box -- Bar Masa has BM written on it, while Sage has what seem to be Hundred Acre 2006 on it. Did Chef Masa designed both? Shaboo when it's open. Did you heard anything about Chef Masa himself? Once again thanks for the post. Full disclosure: Pastry Chef Lura (not Laura) Poland is my fiancee, so I can't claim to have an objective opinion about Sage. She read your review, by the way, and was almost as excited to see you mention her name (despite the misspelling, which she gets a lot) as she was to see you enjoyed her desserts. She has worked very hard to get where she is, and I'm very proud of her. It's really neat to see you praising the same desserts I watched her working on in our very kitchen. I'm so glad they worked for you. I was at Sage on Dec 18 as well, though I was in the dining room. I also went on Dec 17, and have blogged about that myself at my own blog, if I can shamelessly plug that. I haven't had a chance to write up my Dec 18 visit yet, but that's coming soon. On the 18th, I had the scallops entree, and can attest to the quality being as high as we both seemed to find everything else. As you might imagine, I plan on going back quite often, gradually working my way though the menu (if I can before they make changes). 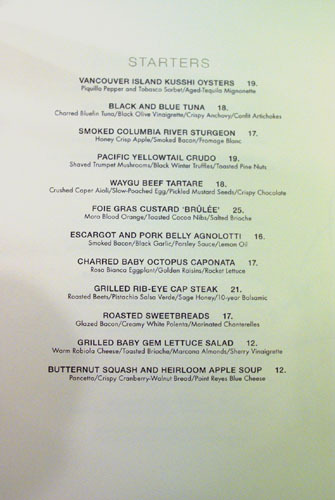 Next time, I will probably have the Pacific Yellowtail Crudo, based on your comments. Again, on behalf of myself and Lura, thank you for your wonderful comments. We're both glad you enjoyed your meal, and appreciate you spreading the word. Dason: Good picks. Interesting that you didn't mention Raku, which everybody raves about. I didn't inquire about the details of the sweetbreads. However, I would suspect veal, given that veal seems to be the most popular at higher-end establishments. As for the vegetarian dish, it felt like a hearty, satisfying appetizer. If I were a vegetarian, I imagine I'd have to order all four dishes to be satiated. Concerning the yellowtail, given its superficial similarity to the hamachi I typically find in Japanese restaurants, I will assume that it was Japanese amberjack. At Bar Masa, the box is used because Masa himself designed it; supposedly, it's a more stable serving platform for some of the dishes there. At Sage, the Hundred Acre wine box was used only for the bread. I believe it's just a coincidence. Andrew: Thanks for the note! I've made the correction for Lura's name. How did she find out about this blog? What's Lura's background (e.g. where did she work before)? I might have misunstood some of the news, but from what I have read, I got the feeling Chef Masa will be the one running Shaboo.
" Shaboo at Aria features Chef Masayoshi Takayama's signature omakase style, for which he intricately designs a set menu using only the best seasonal ingredients available"
" Q) How’s the food at Shaboo at ARIA Resort at CityCenter Las Vegas? Ans) Omakase style is essentially allowing the chef to make the selections for you and you get to go along for a culinary ride. This should be a unique experience and an opportunity to sample some incredible creations by Chef Masayoshi Takayama. " 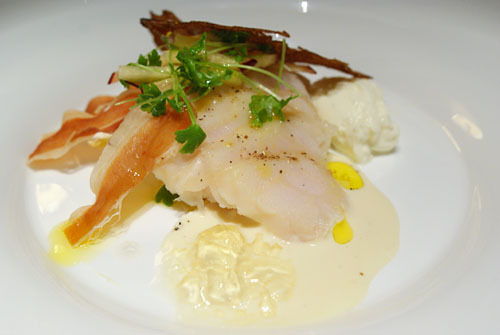 "At Shaboo, Chef Masa’s menu will change each evening and will be based on the best seasonally available products. The restaurant will be refined and sleek, yet awe-inspiring with ceilings that soar to 42 feet. Materials will be natural and understated, maintaining Chef Masa’s commitment to simple food and an inspiring environment in which to enjoy it." "Shaboo, will offer an exclusive and intimate dining experience. Shaboo will feature Masa’s signature omakase style, for which he intricately designs a set menu using only the best seasonal ingredients available that is served to every guest. 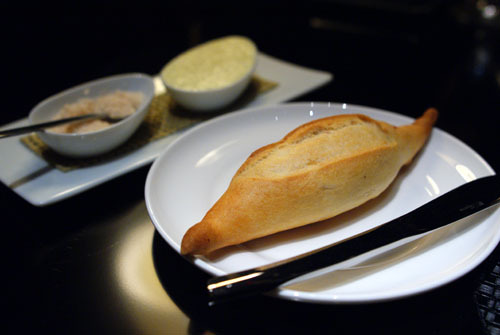 Masa will composes dishes that celebrate the simplicity of each ingredient, maintaining their pure essences." "... Takayama says, “It’s a new, gigantic building where I get to create my idea, my style. It’s more than the food.” ... Over in the more intimate 52-seat Shaboo located inside Bar Masa, Chef Takayama will be serving omakase style a tasting menu"
There also one interview (I don't recall which website I read it) which Chef Masa asked about the move. In his own way, Chef Masa reply by its easiler to get money out of people in Vegas then NYC. As for Abriya Ruku, I see it as more of a yakitori, late night snack and drinking place than a Japanese Restaurant. Don't not take me the wrong way,I love their food, but I have a hard time with any restaurant who call themself "authentic" and end up seving something else. 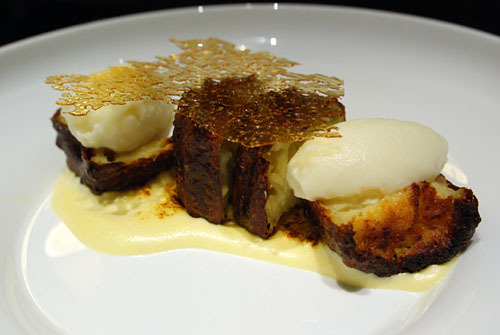 (In Ruku case, some of their Rice/Noodles dishes and dessert have American and France influance). If they claim the food are "authentic" on their menu/website/post, I should be able to receive food nothing but "authentic"
Thanks for fixing Lura's name. It's an unusual spelling, and gets mistaken for Laura all the time. But I want to be sure she gets all the credit she is due. I actually found your blog myself, and showed it to her. I was emailing someone about the restaurant, and couldn't remember how to spell Shawn McClain. So I googled his name, and your blog came up. There don't seem to be many reviews of Sage online yet, so I decided to read it. Lura is originally from New Hampshire, and most of the places she's worked are back east. I know she worked at the Italian Farmhouse in Plymouth, but beyond that, I don't have her c.v. memorized. Most recently, she had been working as an assistant pastry cook at Restaurant Charlie in the Palazzo. She started before they opened, and worked there until she accepted the position at Sage. In fact, she would have still been at Trotter's when you reviewed Bar Charlie, so maybe Sage wasn't the first time you've encountered her work after all! Dason: Interesting. I'd be very surprised if Masa actually relocates for more than a few months. I definitely agree about the "easiler to get money out of people in Vegas then NYC" comment though. There is that "Vegas premium" when it comes to prices. Andrew: Thanks for the history! I've included it in the body of the post, as I like to have a bit of background information for the chefs. 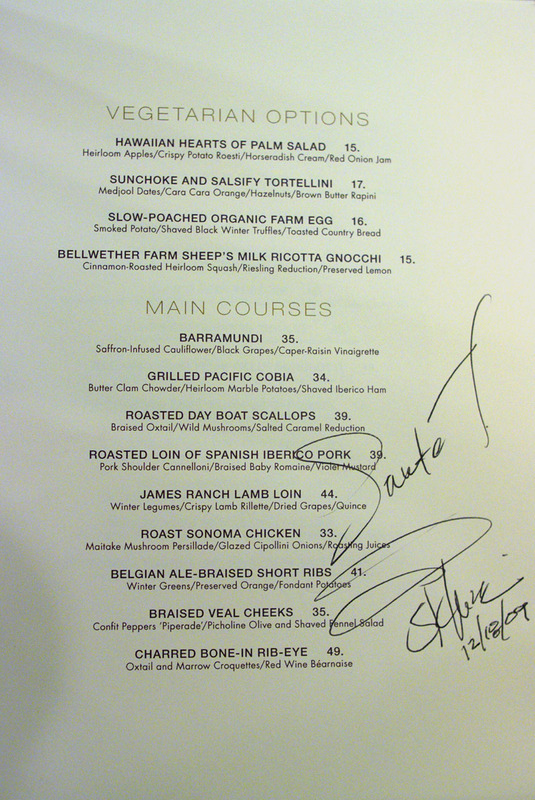 Looks like we can expect some new Michelin Stars in Las Vegas to be added to the ever expanding list. Exciting! Sandra, I wish that were the case, but Michelin has moved out of Las Vegas (and Los Angeles)! 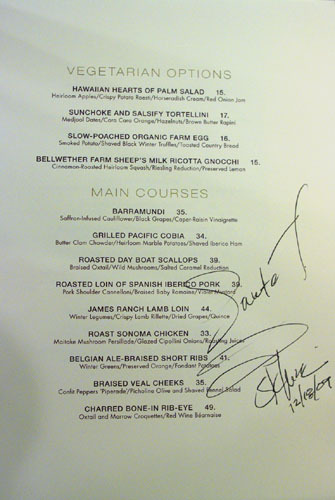 going to vegas next week for Bachelor party and staying at aria...just wondering if you'd go to Sage or Serrano's place as our better meal out. I'd say Sage for the food, but the vibe at Serrano is more suitable for a bachelor party. Thanks to you, we tried Sage and were thrilled with our 6 course tasting menu! That's great to hear Marianne. I'm glad that Sage is still holding up! Kevin...looking for your two cents. Going to Vegas for three nights. Robuchon, Savoy and ....? We're contemplating Sage, Bartolotta or Twist. Thanks for the LV posts. You're definitely on the right track there with Savoy and Robuchon. Of those three choices, I'd do Twist, easily the most interesting, and challenging of the trio (assuming you don't just order the steak there). L'Atelier is also worthy of consideration.